A standard brick house requires foundations in order to keep the walls secure and the building safe. As a shipping container is already a structurally sound object, foundations are not necessary to keep up the walls. However, in this case, something is necessary to keep the containers stable as we will be living in them. 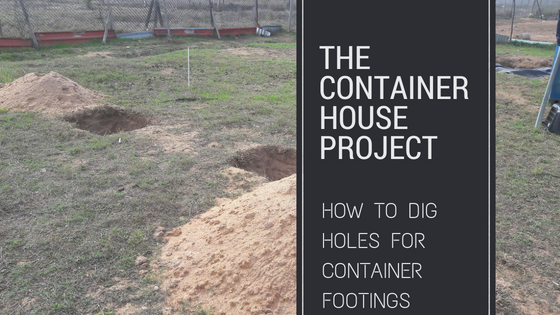 Therefore, our plan of action is to place each container on concrete blocks; the footings. This will also allow us to “tie” each container to the ground, keeping the house even more stable. But, the first job is to dig some holes! washing dishes and laundry for throwing in the holes and slowly we managed to dig through the layers. (This is the part where I was hoping we would dig up some hidden pirate treasure, but we didn’t). Kevin and Louis did a large percentage of the digging themselves, but did in the end hire some strong men to finish the work. Now Cape Town’s rainy season seems to have begun in earnest and we are all grateful for every drop as Cape Town so desperately needs the water. However, now that we need the holes to dry out so that we can fill them with concrete, they are continually being filled with rain water! We do have a bit of time as we are waiting for the structural engineer to conduct a soil analysis and let us have his recommendation for the required hardness of the concrete. The after-effects of a rain storm: The holes for the container footings can no longer be seen under all the water. Mind your step! Full marks to Inspector Dog for ensuring that the holes are expertly executed! Those are some fine-looking holes indeed. The rain could have been a bit more cooperative, though, and made an appearance before commencement of works rather than after.